The project aims to improve the implementation of the Guidance and internationally-agreed standards on responsible production, sourcing and supply chain management in the agricultural sector. Enterprises involved in the agricultural sector are critical for the fulfilment of the Sustainable Development Goals - playing a key role in generating much-needed investment, decent employment, developing productivity and supply chains that benefit producers and consumers. At the same time, business activities in this sector can undermine this potential when their operations or supply chains negatively impact workers, human rights, the environment, food security/nutrition, and tenure rights. The OECD Guidelines for Multinational Enterprises, first adopted in 1976, and the Principles for Responsible Investment in Agriculture and Food Systems of the Committee on World Food Security, endorsed by governments and representatives of the private sector and civil society in 2014, are prominent international instruments for responsible business conduct. 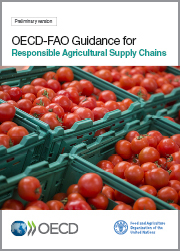 Building on these instruments, the OECD-FAO Guidance for Responsible Agricultural Supply Chains was developed with the support of a multi-stakeholder group representing governments, business, workers and civil society. It provides a practical tool to help enterprises observe these and other standards of responsible business conduct. The launch of this pilot project will strengthen the ability of companies to avoid contributing to adverse impacts on people, the environment and society while meeting global sustainability challenges. The Guidance targets domestic and international, small, medium and large enterprises across the entire agricultural supply chain, from the farm to the consumer. Since its adoption in 2016, it has been endorsed by multiple governments, including G7 Agricultural Ministers. This work is carried out within the OECD’s sectoral work on due diligence for responsible business conduct and the FAO’s Umbrella Programme which supports sustainable and responsible investment in agriculture and food systems across the globe. For further information, journalists are invited to contact the OECD’s Tyler Gillard (+33 1 45 24 90 93; tyler.gillard@oecd.org) or the FAO's Zoie Jones (+39 6 570 56309; zoie.jones@fao.org).